This multipurpose tool is made of hand-forged steel, deeply set in a hardwood handle. The curve of the pointed blade allows soil to be thrown to the side like a plow, and the edges can be used to level, mound, and loosen soil and cover seeds. Great for weeding, digging holes, opening and closing rows, loosening soil around plants, and thinning plants. 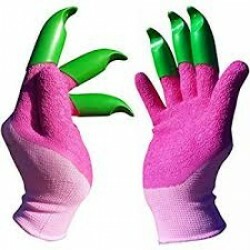 Light on the hands, it is ideal for people who suffer from arthritis or carpal tunnel. The long handle (54" / 145cm) makes weeding easy on the back. Tested and perfected over thousands of years in Korea: this is a must have tool for all gardeners! This multipurpose tool is made of hand-forged steel, deeply set in a hardwood handle. The curve of .. The Original Hori Hori Knife now with Long Handle for more leverage. The Hori Hori garden knife can.. The Japanese made Hori Hori Knife is a standard utility knife in Japan used for EVERYTHING. It is s.. This Chrome Coated Stainless Steel Weeding Knife boasts both straight and serrated edges that's usef.. The garden tool that fits like a glove! Honey Badger Gloves are the original digging glove. 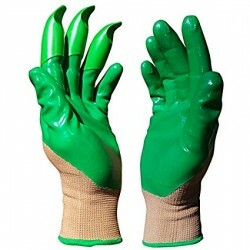 ..
Honey Badger Digging Gloves Latex Unisex Blue Medium 8"
The garden tool that fits like a glove! Honey Badger Gloves are the original digging glove. They w..
Honey Badger Digging Gloves Latex Unisex Blue Large 9"
The garden tool that fits like a glove!Honey Badger Gloves are the original digging glove. .. The weed shredder tool is the ideal tool for removing tough weeds, for cultivating soil and for clea..